Plan B has been added to the bill for this year's Kendal Calling festival. Plan A having been KOed, it’s Plan B for this year’s Kendal Calling festival. London-born hip-hop and soul star Plan B, alias Ben Drew, is to top the bill at the Cumbrian festival on Saturday, July 28, replacing US hip-hop act Run DMC. That 11th-hour change of plan, prompted by a scheduling mix-up, was announced yesterday, July 24, just two days before this year’s festival gets under way. A spokesman for the event said: “It’s time for another first in the Kendal Calling history books. “At less than a week’s notice, we have had to find a new Saturday night headliner, and we are delighted to let you know that Plan B will be bringing his Ill Manors rap and soulful Motown vibes to the fields of Kendal Calling. “It’s with regret that we are not able to host Run DMC at this year’s event. “We must hold our hands up as a scheduling issue only picked up in the last week has left them unable to attend. Saturday’s show is Plan B’s first festival headline slot since the release of his fourth album, Heaven Before All Hell Breaks Loose, a No 5 hit, in May this year as a follow-up to 2012’s chart-topping Ill Manors soundtrack, though he will also be taking to the stage next month at Bestival in Dorset and Essex’s Rize Festival. It’s also his first appearance at Kendal Calling, as would have been the case for Run DMC had the event’s plan A worked out. The Londoner has two other albums on his CV – Who Needs Actions When You Got Words, a No 30 hit in 2006, and The Defamation of Strickland Banks, a No 1 in 2010 – and has hit the singles chart’s top 10 four times, with Stay Too Long and She Said in 2010, and the title track of Ill Manors in 2012, as well as End Credits with Chase and Status in 2009. He joins Hacienda Classical, Catfish and the Bottlemen and the Libertines at the top of the bill for this year’s four-day festival at Lowther Deer Park, near Penrith. Next on the bill are James, Ocean Colour Scene and Shed Seven, and also playing are the likes of White Lies, Peter Hook and the Light, the Sherlocks, Fun Lovin’ Criminals, the Wailers, Marmozets, Bugzy Malone, Slow Readers’ Club and Pins. The Libertines, headlining on Sunday, are newcomers to the festival, though the latter’s frontman, Peter Doherty, played a solo show there in 2016. Catfish and the Bottleman, rounding things off on Friday, are old hands, however, the Welsh alternative rock act having played at the festival twice before, in 2014 and 2016. Alternative rock veterans James have also played sets at Kendal twice before, in 2012 and 2015, and though Ocean Colour Scene are strangers to the event, band members Simon Fowler and Oscar Harrison performed at its 2014 incarnation as a duo. Catfish and the Bottlemen, topping the bill on the Friday night, are the festival’s third Welsh headliner in two years, following on from the Manic Street Preachers and Stereophonics last summer. The quartet, formed in Llandudno in 2007, have hit the top 10 with both their LPs to date, The Balcony making it to No 10 in 2014 and The Ride topping the album chart two years later. The Libertines, formed in London in 1997 and reunited in 2014 after splitting up in 2004, have, like the Bottlemen, notched up two top 10 LPs – their self titled second album, a No 1 in 2004, and Anthems for Doomed Youth, a No 3 in 2015, and like Run DMC, they’ve hit the top 10 of the singles chart twice, with Can’t Stand Me Now and What Became of the Likely Lads, a No 2 and No 9 respectively, both in 2004. 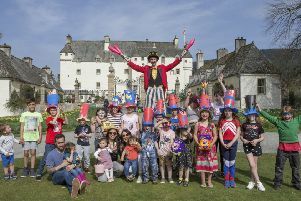 This year’s festival, the 13th altogether, is the 10th to be held at Lowther Deer Park, 35 miles south of the England-Scotland border and just a two-hour drive from Selkirk, Kendal itself having hosted the first three.